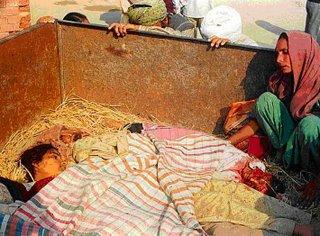 After the assassination of Indra Gandhi on October 31, 1984, Sikhs were butchered across India. This is a story about a Sikh couple living in an isolated village outside of Punjab. The couple was young and were amritdhari. 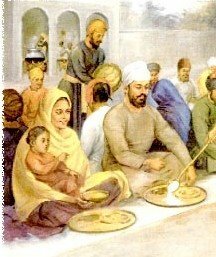 The Singhni wore a dastaar and they had a young child. The Sikh couple had an isolated farmhouse in a Hindu dominated area. When news of the assassination reached the area, and it was found out that Sikhs were being killed, some local thugs also decided it was the perfect chance to loot the farmhouse. The Singh found out about these plans from some well wishers and told his wife that they had very little time and an attack was coming. The Singh said that they should leave their farm and escape to save their lives. The Singhnee however reminded him that they had done Parkash of Sri Guru Granth Sahib on the top floor of the house and how could they run away from Guru Sahib? The Singh again repeated that there was an attack coming and said that their young child would be killed. 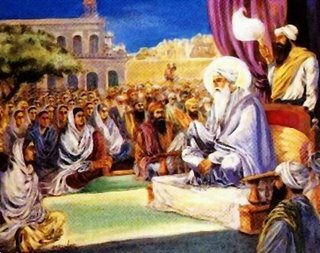 Singhnee jee insisted again that it would be wrong to run away from Guru Sahib and let the mob disrespect Guru Sahib's saroop. The Singh in frustration then said, "Once they kill us, they will disrespect the saroop anyways so what is the point in staying? We can't save the saroop if we're dead. The best we can do is save ourselves now. There is no benefit in staying! You are being stubborn and stupid." 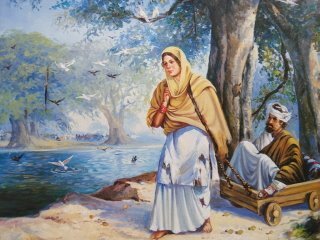 The Singhnee replied that while she had breath in her body, she would not abandon Guru Sahib, even to save her life and while she was alive, no one could dare do any disrespect. With the mob now on its way, the Singh in frustration told his Singhnee that she could do what she wanted but he was leaving with their son. He then took the infant and escaped. Singhnee jee went to Guru Sahib's room, and did ardaas. 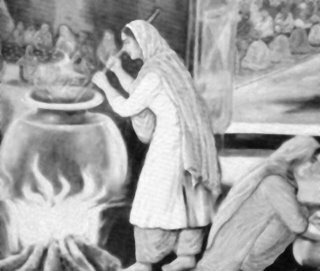 She asked Guru Sahib for protection and for the courage to, if need be, become Shahid in this seva. She then took a kirpan and waited. Some days later, the Singh came back to the village to check on the fate of his wife and their property. He fully expected that his wife would be assaulted and killed and their home looted. As he was nervously walking to his home, a Hindu acquaintence stopped him and asked, "Singh, where did you gather all those Nihangs from so quickly that day???!" The Singh was confused and asked, "What do you mean?" The Hindu replied, "That day, when the mob went to attack your house, your wife came and stood in the door and she was surrounded by so many massive Nihangs who were so tall and carrying all kinds of weapons. Where did you gather all of them from so quickly?" The Singh realised that Shaheed Singhs had themselves come and protected Guru Sahib's saroop and his Singhnee's courage had been rewarded. He went home and begged for forgivness from his Singhnee and told her about how all the villagers were talking about the army of Nihangs that had protected their house. 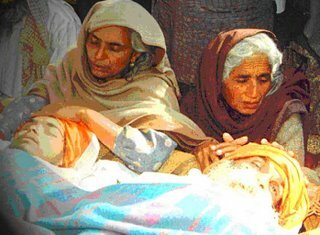 Please refer to the following articles that have been posted on neverforget84.com website. 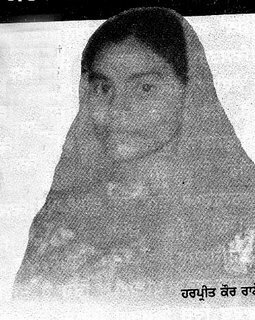 Many Sikh women participated in the Sikh resistance movement as fighters. Like their sisters from past ages, Sikh women joined their brothers in the fight for freedom. Many brave Singhnees fought side by Side with Singhs and attained Shaheedi. 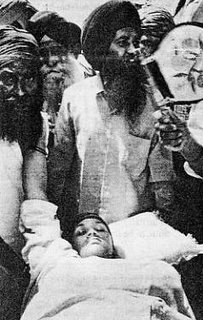 "...A historical record of a carnage, the biggest-ever massacre anywhere in India, of how 4000 Sikhs were roasted alive in three days in November 1984, right in the Capital of “the World’s largest democracy”, of how mobs led by members of the “secular” Congress party had a free run of Delhi, as the police either looked the other way or disarmed & arrested the Sikhs who acted in self – defence, of how the state and its agencies deflected all attempts over the years to secure justice for the victims..."
You can fool the world no more. 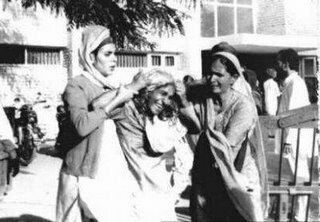 Today, we will remember one of the darkest moments in our history, November 1984. A year where many young men and women became Shaheeds. 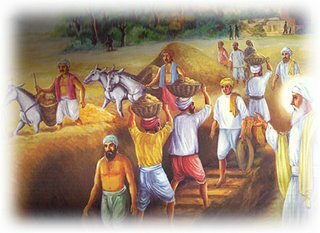 Please, take a moment to reflect back on our history, and remember those who literally gave their heads to Guru Ji, for the sake of this Panth. The following story is added for the purposes of understanding the moments many lived through during 1984. At the time, we were staying in Chilla village, near Trilokpuri in east Delhi. My father came back early from work, looking very tense, and told us about the riots in the city, that people were killing Sikhs all over Delhi. But it was not as if he, or the neighbourhood, felt that everything around us would change in the next few hours. We went up to the terrace and saw that our neighbourhood gurdwara had been set on fire. That was when we felt the first jolt of panic. The rioting was no longer ‘in the city’. It was coming nearer home. We decided to go to the gurdwara to protect it as best as we could. There was my father, his younger brother, my mother and grandmother and we, the children. On our way, we saw hordes of murderous-looking people and fierce fighting. The police stopped us and told us to return home. We did, but that was a mistake. At home, we were sitting ducks. A mob broke down the wooden door of our house, dragged out all the menfolk one by one, beat them up and then set them on fire. My father was first. We couldn’t see what happened, because they took him out of the house. Then it was his younger brother. He had shorn his hair. At first, they were willing to let him go. But then they changed their mind, dragged him out again, beat him up and set him on fire as well. The attackers did not even spare my poor old grandmother. They broke her arm and abused her. They told her that she should leave the neighbourhood immediately or they would kill all the children. I can still see their vicious faces. They were shouting, "Tune hamaari maa ko maara hai. Hum tujhe maarenge! 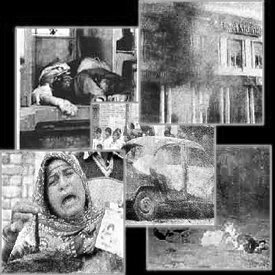 You killed our mother (Indira Gandhi), we will kill you!" They put burning tyres around the necks of the Sikhs they were torturing before the slaughter, and shouted, "Dekho sardaar kaise naach rahe hain! Look how the Sikhs are dancing!" My grandmother and mother ran away with the children. We hid in a wilderness, away from the residential colonies. For three days and nights, we stayed in hiding. On the fourth day, the army came in and took over from the police. That was the first time we felt safe. Later, we were informed that we would be resettled and awarded compensation. It is true that we were given a one-time compensation. Widows were given jobs, but not near their homes. Their places of work were scattered all over Delhi. And they have to raise their families on the pittance they make in these ‘Class IV’ jobs. There is an area here in Tilak Vihar called the Widows’ Colony. It’s only for the widows of the 1984 riots. That’s where we were shunted. There was no other attempt to reach out to us in any way. Not one leader, from any community or political party, ever comes this way. In the era of Guru Ram Das Ji, one cannot leave out Rajni, youngest daughter of Rai Duni Chand, revenue collector (kardar) of Patti. (The story has all the myth, magic and miracles of a genuine Sakhi, but is nevertheless a charming story). 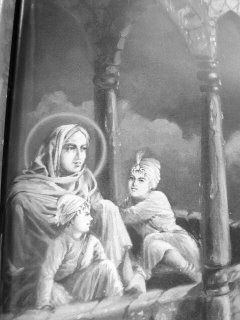 Rajni was a Sikh, a disciple of the Guru. One day she was sitting with her sisters admiring some new clothing they all had received from their father. The girls were ecstatic and exclaiming how good their father was to them. Rajni observed that all gifts are ultimately from God. Their father was merely an instrument of His greatness. Unfortunately for her, he overheard her comment and became very angry. It was not the First time that she incurred his wrath because of her extreme piety. The infuriated father, believing her to be an ungrateful wretch, married her to a leper with a taunt that he would see how her God would help her lead a normal life. The leper was severely disfigured and a foul smell came from his body. The poor girl had accepted her fate ungrudgingly and worked hard to maintain herself and her crippled husband. She kept repeating the name of God, and was certain that he was testing her with this turn of events. She was forced to beg for a living. Still she bathed and fed her leper husband, never losing faith. Only by the actions of destiny does she rise up and burn herself, as a 'satee'. IIPauseII Imitating what she sees, with her stubborn mind-set, she goes into the fire. To obtain the state of life of Nirvaanaa, meditate in remembrance on the One Lord. There is no other place; how else can we be comforted? I have seen the whole world - without the Lord's Name, there is no peace at all. Body and wealth shall return to dust - hardly anyone realizes this. Pleasure, beauty and delicious tastes are useless; what are you doing, O mortal? One whom the Lord Himself misleads, does not understand His awesome power. Those who are imbued with the Love of the Lord attain Nirvaanaa, singing the Praises of the True One. Husband – if you are holding my hand in marriage then I will not leave your side until the day I die. One day, she reached the site of a pool on her way to a neighboring village. Placing the basket containing her husband by the side of the pool, she had gone off on an errand, most probably to look for food. In the meantime, her crippled husband had seen a black crow dip into the water of the pool and come out white. Amazed at this miracle, the man crawled up to the edge of the pool and managed a dip. He found himself completely cured. When his wife returned, she was amazed to find her husband in good health. He was handsome and whole. At first, she was alarmed and suspected that he might be a different person. He had, however, kept one finger with leprosy marks un-dipped. He showed her the diseased finger as proof of his identity. 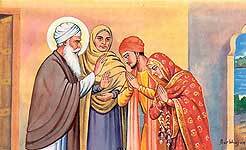 The couple thanked God, and went to the Guru to seek his blessings. 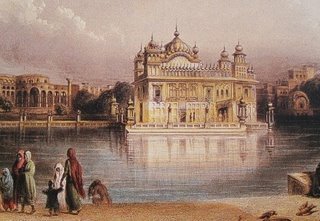 The pool was the future site of the Sri Harminder Sahib. The medicinal properties of the water were said to have come from Basil (Tulsi), which grew in abundance on its banks. Guru Amar Das Ji used to pick the herb there to make poultices for an infected toe that plagued Guru Angad Ji. The legendary importance of the site highlights the medicinal properties of the waters of the pool, Rajni's leper husband was cured in. 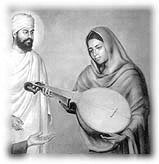 Sakhi relates that if you keep faith in God then one day all rewards are paid. 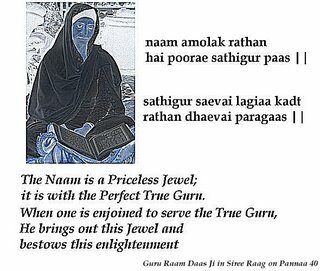 Bibi Rajni had always kept the Faith in Guru and God, being happy with whatever she had and thus was rewarded at the end. Bibi Rajni, was known for her unmatched dedication, and rewarded the community through the construction of the sacred pool of Sri Harminder Sahib in Amritsar. Consider the time and the moment-when should we worship the Lord? Night and day, one who is attuned to the Name of the True Lord is true. 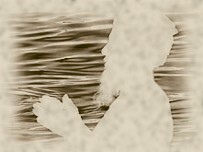 If someone forgets the Beloved Lord, even for an instant, what sort of devotion is that? O my mind, meditate on the Name of the Lord. With intuitive ease, cultivate your farm, and plant the Seed of the True Name. The seedlings have sprouted luxuriantly, and with intuitive ease, the mind is satisfied. The Word of the Guru's Shabad is Ambrosial Nectar; drinking it in, thirst is quenched. 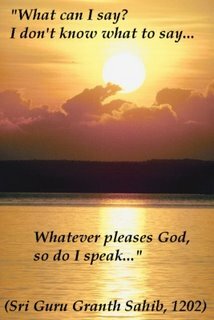 In speaking, in seeing and in words, remain immersed in the Shabad. 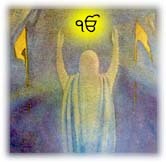 The Word of the Guru's Bani vibrates throughout the four ages. As Truth, it teaches Truth. By His Grace, we meditate on the Naam, the Name of the Lord. Without His Mercy, it cannot be obtained. Through perfect good destiny, one finds the Sat Sangat, the True Congregation, and one comes to meet the True Guru. Night and day, remain attuned to the Naam, and the pain of corruption shall be dispelled from within. When any one wanted to be with Sri Guru Amar Das Ji and be in His Darshan, they had to comply with some simple instructions. 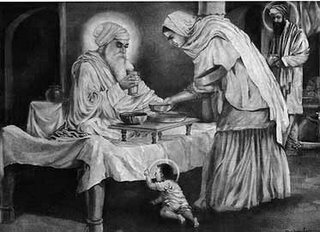 First, they had to eat from the Guru's kitchen with all his other guests regardless of status or gender. Women were asked to remove their veils. The Raja of Haripur was no exception. He came with his entourage of wives, and all were asked to have a meal first. The youngest wife was very shy and refused to remove her veil. The Guru asked her what the problem was. In those days, women never ate with men and were certainly not used to he spoken to by men. The poor girl was totally confused and embarrassed. She ran out to hide herself. The Raja wanting to please the Guru, feigned disgust with her behavior and abandoned her altogether. Thus, when she returned home, she was left behind, alone and frightened. This was 500 years ago, when women were not able to work and support themselves independently. This poor girl was far away from family and friends. She hid in the forest, and people said she went totally insane. 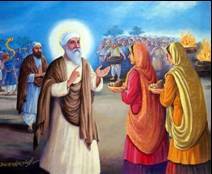 The Guru and his Sangat had many disciples and they all did their chores together and listened to the Guru's teaching. There was one man who came from a place near Shaikhupura which is now in Pakistan. He left his home and joined the Guru's camp at Goindwal. He took upon himself the responsibility of bringing firewood daily for the kitchen. One day, while he was in the forest, he had a terrible clash with an insane woman. She was filthy, her clothes were torn, and her hair was matted. He startled her when he accidentally tripped over her. She reacted by screaming and biting and clawing. He managed to subdue her with kind words and a strong arm. 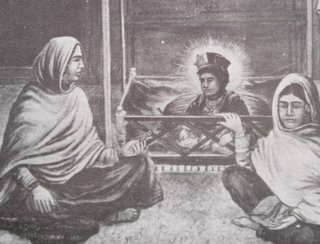 Covering her with his shawl, he brought her to the Guru. After taking a bath and eating well in the kitchen, the lady was invited to join the congregation and listen to the prayers and the teachings. A great peace entered her soul and she was able to slowly regain her strength and self-esteem. 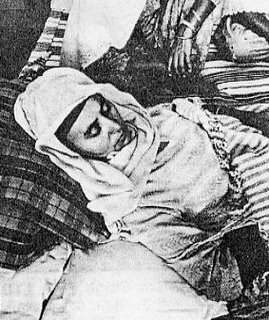 She was once the Rani of Haripur, but no one knew her real name. 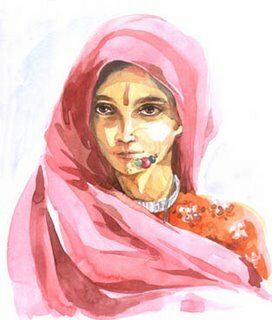 As she grew stronger and joined the others in chores as well as prayers, she was often heard muttering "sachan sach" meaning "truth is truth". This soon became her nickname. As time passed, she became totally cured, a confident GurSikh; Physically & Mentally Healthy. The Guru was impressed with her commitment and devotion. She eventually married the gentleman who had rescued her against her will from the forest. 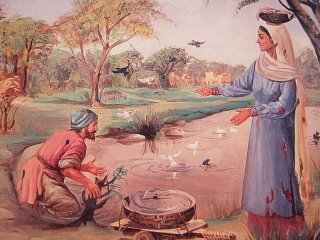 Mata Sachan Sach was made a masand and sent with her husband to his home in west-Punjab to preach the word of God. I had to do a post for Sikh Speak, because when I opened up the online magazine, I was blown away. It is amazing how well it is put together. Truly, you can see how much work and dedication is been put in it. 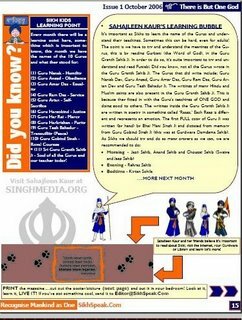 Be updated with current events, learn about Sikh history, read beautiful articles by Sikhs around the world, and understand Gurbani! Check out Sikh Speak online magazine, full of great articles! In this new age of communication, Sikhs around the world can help out with this magazine. I think many of us know about it, but we probably can all contribute to the magazine by sending in inspirational stories, beautiful pictures, and historical Sikh articles. Not only would you be helping out the magazine, but will be inspiring Sikhs worldwide. Waaho! Waaho! Is the Bani, the Word, of the Formless Lord. There is no other as great as He is. Waaho! Waaho! The Lord is unfathomable and inaccessible. Waaho! Waaho! He is the True One. Waaho! Waaho! He is the self-existent Lord. Waaho! Waaho! As He wills, so it comes to pass. Waaho! Waaho! 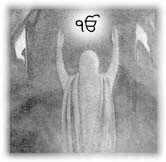 Is the Ambrosial Nectar of the Naam, the Name of the Lord, obtained by the Gurmukh. Waaho! Waaho! This is realized by His Grace, as He Himself grants His Grace. The stages of Sunneyeh (listening to gurbani indeep meditation in the Sunn Smadhi) and Munneyaa (Belief) as described in Gurbani are very high spiritual states. Full belief and commitment, full faith and trust, full devotion and love, takes us to higher and higher realms of eternal truth and spirituality. As our love keeps on enhancing we keep on doing more and more Gurbani in our day to day life. 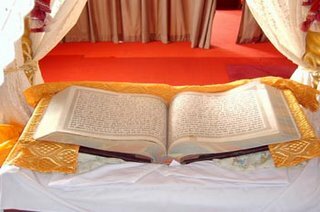 We keep enhancing the practice of Gurbani in our day to day deeds, actions, reactions, thoughts, mental outlook and behavior. We keep on progressing faster and faster on this path to Sach Khand (God’s realm of Truth). Bani is the Guru, and the Guru is Bani. Within Bani is all the Amrit. VAHO VAHO BANI NIRANKAAR HAI. Wondrous, wondorus Bani is Formless. Are we listening to the Guru? Are we accepting the Guru's word? Are we doing what the Guru is telling us to do?